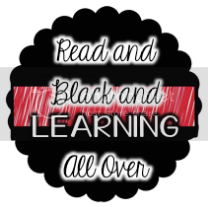 Read and Black and Learning All Over: First Two Weeks BLURR! And Classroom REVEAL!! Ok, so two weeks have gone by since the beginning of the school year. I just can't believe it. I've been sucked into my obsessive planning routine and need to remember my me time. I don't think I was home before 7:30 any night this week! On the plus side, our laminator is finally fixed and I was able to finish most of my room. Thanks to many of you amazing bloggers who put your ideas and creative work out there, I am please with my result. How amazing is Kristen at Ladybug's Teacher Files? 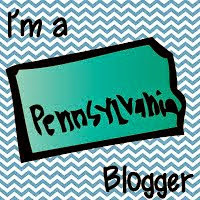 She has so many amazing things on her blog and TpT store. I think half of the visuals in my classroom are courtesy of her. On the far right is her creation of a CRAFT board I will use during Daily 5/Cafe time. 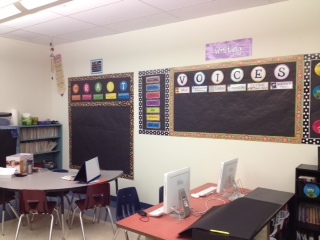 On the right is my writing VOICES board. I became very inspired by the neon and circles and decided to make that my theme for the year. (Along with zebra print, which I LOVE). Next is my classroom library, reading strategies board, and reading genre board. 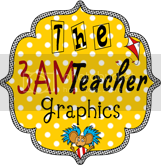 The genre circles are courtesy of Kristen at Ladybug's Teacher Files. The link will take you to her TpT store where I got the genre circles. I made the reading strategy circles to go with the theme of the room. We use the Fountas and Pinnel strategies. Here is a close up of my library. Here are the cubbies. You can see the book boxes for my kiddos. Thanks to Kristen (again!) I taped each student's class number to their box. The link will take you to the blog post where she added the number signs (and they're free because she is amazing). I got this inspiration from Christi at Mrs. Fultz's Corner when she had an awesome post last week for organizing attendance and lunch count. Hers was on a cookie sheet, but I just put mine right onto my white board. This awesome zebra tape came from Elmers and peels right off when I need it to, so I don't think it will ruin my board. 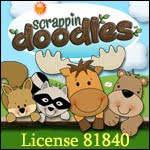 Did I mention how awesome Kristen at Ladybug's Teacher Files is? These are her specials signs (which she also offers for free on TpT). I purchased all her subject circles. My next project is to use those to create our classroom schedule on the wall. Ok, so, I'm not quite finishes, but I'm on my way. I'm ready for a year filled with learning! What theme have you gone with this year? Is it an old faithful or a new venture?